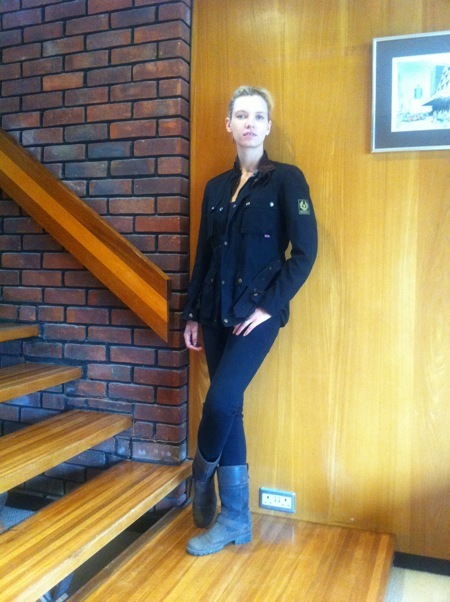 A few weeks ago I went to the Belstaff sample sale and picked myself up a couple of bargains! Firstly, a skirt, but I’ll tell you about that when I’ve managed to actually get the blasted thing over my hips. (Yes, one of those optimistic purchases!) The real gem, though, is this Trailmaster jacket – I absolutely love it! It makes me feel strangely powerful when I put it on, like I’m about to go and drive a tank or something, but I think that might be because it has so many jangly bits of metal on it! These jackets usually sell for £389 I think, so I was rather pleased that I paid £180. I was looking for a jacket that I could wear on cooler summer days – something non-leathery and non-sweat-inducing, and was thinking that I would go for a Barbour, but when I saw this I instantly liked it! If you want to keep in the loop with sample sales (I go to a few every year, but only for brands I really love) then you can register at Fashion Confidential and they send you updates and alerts. Many sample sales are just rooms full of tat that nobody wants, but now and then you can find real gems. I got my Jenny Packham wedding dress at her sample sale -for £190, reduced from a couple of thousand! One bad, bad thing about the jacket though: I stupidly wore it when I was carrying my Mulberry Tilly (pale sparkle tweed leather!) and the dye rubbed off onto the bag. Boooo. I’m finding it hard to forgive Trailmaster and have therefore shut him in the coat cupboard until he has learned how to behave himself. The big bully!